The OME-PCI-1202 series is a family of high performance data acquisition boards for the PCI bus. They feature a continuous, 110 KHz, gap-free data acquisition under DOS and Windows. The OME-PCI-1202 provides 32 single-ended or 16 differential analog inputs. 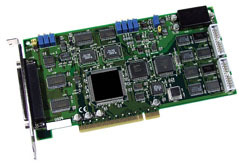 Both the OME-PCI-1202L and OME-PCI-1202H provide software programable input ranges. The OME-PCI-1202L offers low gain settings of 0.5, 1, 2, 4 and 8. The OME-PCI-1202H offers high gain ranges of 0.5/1/5/10/50/100/500/1000. The OME-PCI-1202 contains two 12-bit D/A converts that can generate output voltages in the range of ±5 or ±10 V. Sixteen channels of digital input and 16 channels of digital output are also available. All data acquisition boards are supplied with a standard software development kit for Windows XP/Vista/7. The software development kit includes DLL files for programming in C, C++ or other high level languages and OCX files for Visual Basic or Active X programming. LabView drivers are also included. OME-DB-1825 Screw Terminal Panel for Analog Input Channels. Each OME-PCI-1202H and OME-PCI-1202L data acquisition board includes complete operator’s manual on CD ROM and software development kit.